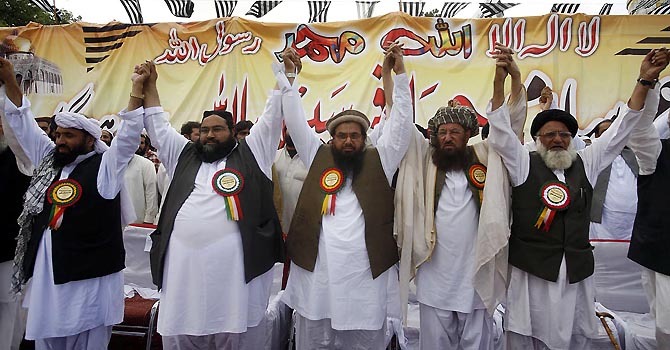 Tahir Ashrafi Asks, Whose Side Are We On? He said as promoting Afghan jihad was the policy of the government, why the jihadis were now being called terrorists. This is a question that should be taken up by every talk show host and addressed in every newspaper in the country. Is promoting Afghan jihad official state policy? If so, why are we also supporting NATO? Whose side are we on? Is Jihad official policy of the state? Does the state still consider Afghan Taliban as ‘good Taliban’? Or are they terrorists? Tahir Ashrafi is confused about whose side we are on. Are we supporting Taliban? Or are we against Taliban? It is not clear to Tahir Ashrafi, and it is not clear to anyone else. It’s time the state answer the question. This entry was posted in Blogs and tagged afghanistan, Jihad, Tahir Ashrafi, terrorism by Mahmood Adeel. Bookmark the permalink.